I have been working on my family tree and going through old albums. I came across this photo of my great grandmother “Ma” in her kitchen. This is a room she spent a lot of time in. The reason that I am sharing the photo is because I wanted to show the readers what a real kitchen of a real person looked like in 1958. This is the kitchen were she canned all the food that she, her husband and their ELEVEN children would need. As a matter of fact, she has so many children that her own children has some children of their own before her last little ones were born. Some, like my grandmother, moved her family in with Ma’s. Every single thing that they ate came from their farm and the garden. Every vegetable that they would eat in the winter was prepared right there in that kitchen. She had to can everything that would not keep. Green beans, beets, tomatoes, asparagus, leeks, cucumbers, peaches, pears, apples, plums… everything from veg to preserves was all canned. I am not sure if you see what I am driving at? Did you notice in the photo that there was not a little bit of counter top in that kitchen? No storage either? The food was kept in the cellar and that little shelf above the stove was for every day dishes and cutlery. It was also for keeping things warm, for those who were late. All food prep and eating were done on the same table, covered in oil cloth, all the cooking was done there on the stove unless in the middle of summer when the stove was moved out into the back kitchen. All the food prep would have to be put away and everything wiped before the table could be set and people could eat. It was not unusual for there to be 30 people eating in this kitchen. I will think about this photo the next time I start thinking the 6 feet of counter at THO is small. Clearly this tiny houser has things pretty good. I don’t mean to glorify those days. I know that times were hard and that there was so much work to be done. Poor Ma never stopped working! Her hands were like leather on bones. Truthfully, I think Ma must have been pretty happy by the time 1958 came around and they were sufficiently recovered from the great depression that times were easier and she could buy a jar of pickles instead of making everything. The question is, do you think you could go without cupboards and countertops in your house? Modern kitchens often have to provide space for food storage and cooking equipment, this is true in all of the homes I have lived in for the last four decades. I haven’t had decent basement storage. I grew up with kitchen’s just like your Great Grandmother’s kitchen. Hot water bath canners are big rigs, they take up a lot of space when stored, empty and full canning jars take a lot of storage space, food grinders, peelers, dehydrators, all manner of manual food processing equipment takes up an incredible amount of space. That basement storage, which is not shown in your picture, was the equivalent of having lots and lots and lots of kitchen cupboards. I still do canning and use various food preservation methods (different from meal preparation), and having done these things in both the old style kitchens with my Mother and Grandmother, and the modern kitchens, I would choose the old style kitchen with the basement storage any day. Using the kitchen table as a work area is very convenient, it is large, and you can access it from four sides, loved it. The kitchen table work area also meant that one could work well with others, giving the old saying “many hands make light work” meaning. Hi Maggie, I know exactly what you mean. This is also the way I grew up. I have to say I miss this kind of work around the table with my family. Today it is always me alone in the kitchen and it feels like more of a chore than it did back then. I don’t mind the kitchen. I like to cook, really… but what I mean is that I miss the time spent with loved ones while things just got done. I find it extremely hard to get by without counter space! I have lived in a small apartment with about 60 cm of counter space, and cooked for 3 people. It was difficult to do even the simplest of things – like plating the food once everything was prepared – there was no place to set the plates down! But like everything – you work with what you have! I would just prefer to have more counter space! I think I could do without cupboard space – typically they are filled with things we rarely use anyway. This brings back happy memories of the 60’s when I would go painting there down by the Sugar Shack, Eagles Nest and beaver dam. They were so good to me. I spent many times having dinner there in that kitchen. What wonderful meals she had. Lots of vegetables and meat. How I loved them! Thank you for sharing your memories Shirley! I had no idea that you painted there and I can’t tell you how happy it makes me to know this. I have learned something new today! I also loved to visit there, I would run across to visit them every Sunday. As farmers ourselves pulling up to the table was not the most exciting part of going there but I knew if I went at lunch time then Ma would certainly be using her capable hands in the kitchen. In the warm weather I would stop to pick wild flowers for her along the way and she would happily accept my humble offerings. Dad, if he was out on the porch would try to catch me and often succeed – he gave the most perfectly awful whisker rubs to say hello! I would run around the back way when he was there, to escape those whiskers, stopping always to look at those deep crimson dahlia against the stone. Once I was safe in Ma’s kitchen Dad would come in and we’d go to his study. I loved getting in there with all his books! He was unable to see them then, but this really did not matter because they were all put to memory. He would pull one out and tell me about the poet, about it then hand it to me and recite. He, along with his remarkable memory for words, was an incredible elocutionist. I memorized only one poem, which he taught me when I was little – and even my favourite poet Wordsworth who was introduced to me by him is not put to memory. I think he knew hundreds and thousands by heart. I have a book, you know – his favourite – by his poet Robbie Burns. It is filled with clippings and his memories. From Ma, I have a special thing too. An egg painted with violets. How perfect is it that from him I have words and memories and from her I have food and flowers? That was so interesting to me about your visits there. He was wonderful to me also. I once painted a picture of the house with him sitting in front. I believe M. has that one. It was such a magic place to paint on there property. I sold every oil I ever did there. I used to love to swim down there by the cottage. At one of the family picnics. I got on a horse to have my picture taken. It ran off with me around the race track. It had no saddle and I had never been on a horse before. It was going to run in the barn. when I was saved. When I got off I couldn’t walk I was never so scared! I currently don’t have any kitchen storage so yes I could live without cupboards. I have almost the same amount of counter space you have and it’s done me just well so far. 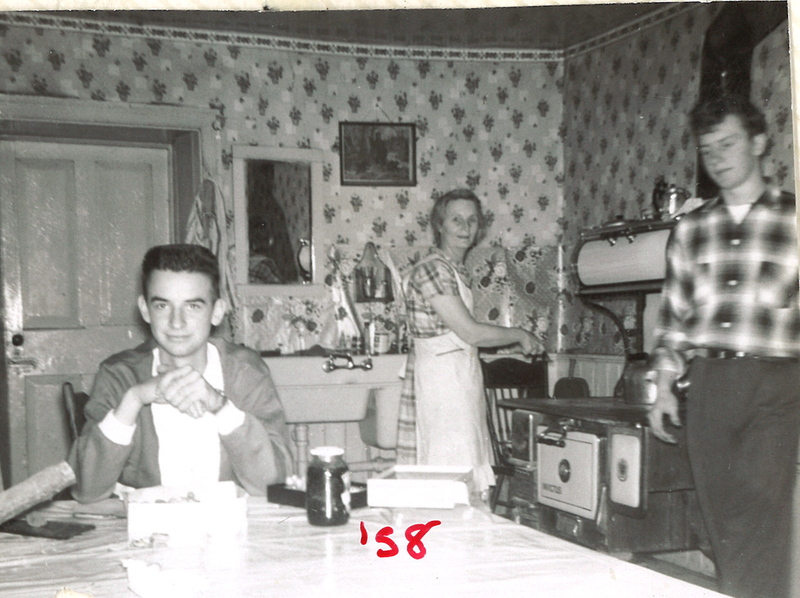 I grew up watching my grandparents and their friends work in kitchens of similar size to your great grandmother’s it’s just the way things were . The huge kitchens of today make no sense to me. Lovely that you shared this. We can all do with far less then we think we need, still its a major feat to get so much food out of so little work space. My great-gran could make a banquet out of leftovers.